Sit at home, in the shadows, in the empty, shadowy flat. The empty, dark flat, things hung on the rail stir softly. 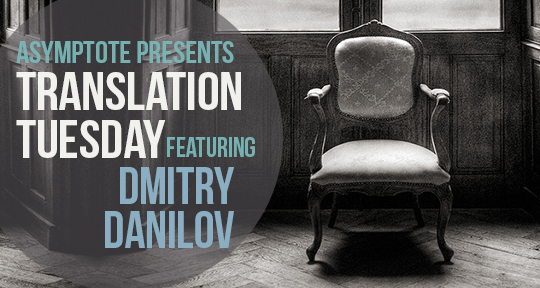 This week’s Translation Tuesday comes from the amazing Russian author Dmitry Danilov. For more microfiction, head over to the brand new Winter 2018 issue of Asymptote! Sit at home, in the shadows, in the empty, shadowy flat. The empty, dark flat, things hung on the rail stir softly. Only in one corner of the empty, dark, shadowy flat does life smoulder with a red-yellowy glimmer. In the corner of the empty, dark flat nestles a human being, a calculating machine works. A lamp illuminates this space in the corner of the empty, shadowy flat; all the rest of the flat is empty and dark. Something is moving in the empty, dark corridor, it’s as though something is flying or crawling, that’s just how it seems, no, something really is moving, don’t pay attention to it. Sit at home. Or no, do something else. Go back into the frosty morning, go outside. Get dressed, go outside. Take ID, keys, don’t forget, or do forget, go outside. Walk along white paths, along white, wide roads, along black, asphalt paths, walk along carriageways, along pedestrian crossings, past lopsided building sites and wandering animals, through places with lots of trolleybuses, through places where there are barns. Get to a very small, almost miniature place, and be in it, in a small, fantastic place, in a place where it’s wondrous to stay. Then, awaken, go further, past shops signposted “Furniture,” past high-rise flats, past squat garages, and suddenly realise this is a completely different town, not the one where you were born and lived, but a completely different one, and now it will be hard, or, rather, completely impossible to return home, to the shadows, to the dark, empty flat. Dmitry Danilov is a Russian author, playwright, and journalist who lives and works in Moscow. He has written numerous short stories and novels, including Black and Green (2004), House Nine (2006), Horizontal Position (2010), The Description of a Town (2012), and There are Things that Are More Important than Football (2015). In 2010, Horizontal Position was nominated for the National Bestseller prize in Russia; in 2011 this novel also reached the final of the Russian literary prize Big book and was shortlisted for the NOS prize. In 2017, he won the Culmination prize for his play The Person from Podolsk. Critics have described Danilov’s prose as comparable to poetry in how is distills reality, not by elevated language, but by building its own structure. Philippa Mullins is a PhD student and a translator working primarily from Russian into English. She is currently based in Moscow.